A wedding party is often comprised of many attendants such as the bridesmaids, flower girl, best man and hostess. Their responsibilities will vary from family to family and culture to culture. One attendant I personally appreciate as an event planner is the hostess! OMG! What I wouldn’t give for a group of hard working, selfless hostess at each wedding I provide services for! Be sure to treat to them to an extra special gift for all the hard work they will provide! Today I came across the PERFECT and cutest token of appreciation for them!!! 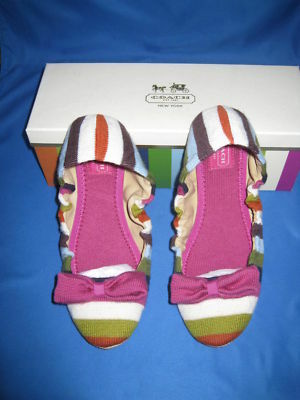 Luxuriously plush slippers knit in our vibrant Heritage stripe, with suede soles and exquisitely soft leather linings. This entry was posted in Events, Fashion, Weddings and tagged attendant gifts, attendants, COACH RIO SLIPPER, slipper, wedding gift. Bookmark the permalink. 3 Responses to A Gift of Comfort! I love them! Hostesses are the backbone (minus the bride and groom)of any good wedding and these would be the perfect gift of appreciation. They look super comfy and at the end of a long day (directing people, helping with set up/tear down, running behind a bride, or any “non-wedding” activity) these would be perfect for tired and achy feet. I think that these slippers would be most appropriate for any hostess. Not only are these slippers an attractive piece but it shows that the bride and groom thought enough of one’s tenacious work, to invest in a pair for you. Being a hostess is hard and I didn’t realize that until I became one a few years back. My feet were swollen from the heels that I was wearing while greeting, serving food, etc. I needed these “Coach” slippers after my work was complete. Good job for creating this idea! I think the slippers are very thoughtful. They are the perfect gift for a hostess who stays on her feet during the entire event. Very fashionable and chic.